Hello Friends! I am back after a marathon week of set reviewing and set 2’ing to give you some of my first impressions of the format! Today is going to be one of those “grab bag” articles, where I just lay out a few assorted thoughts, since I am still recovering from all the work from the past week. Before going on, I wanted to thank everyone who gave feedback on my constructed set review (which can be found here) and limited review (here), as well as my “Hot Takes for Filthy Netdeckers” article (here). I have never done anything like this before, and although I guessed it was harder than it looked, it was way harder than it looked. I have a lot of great ideas how to improve it for next time, so although it was a little bit rougher than some would have liked, that was very much part of the learning experience this time. Thank you so much for everyone who commented and/or read and/or listened to my reviews! You are the reason I do this ♥. I wanted to give a quick shout out to the new rewards system, since I think it is a fabulous upgrade over the previous system. I hope that DWD gains a reputation for generosity and being “Free-to-play friendly”, because they certainly deserve it. I wrote another article some months ago about the Eternal versus Hearthstone model of finance. 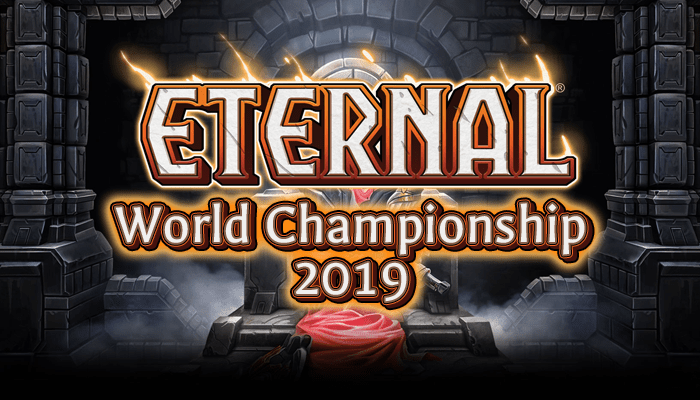 Eternal was miles ahead of HS back then, and now with a reward system that is even more generous, I think Eternal is likely one of the best in the industry. The current system is has shaved a little of the income of heavy grinders in exchange for helping out casuals substantially. As long as you win even 1 match of ranked or casual a day you get a pack! If you never miss a day you should be able to keep up with a competitive collection with little more than that plus daily quests. In exchange, players who play a lot get a little less. After your 10th win of the day every chest is going to be bronze, unlike before where every third would be silver. Clearly, if you are getting a mass of value up front, but a lowered return over a long range, it means that hard-core grinders are going to be a bit behind from before. Being a numbers oriented guy I wanted to check when that point was. Here is a graph that I came up with (I am valuing a pack as 1000 gold, a bronze chest at 75 gold, and a silver chest as 295 gold, as spelled out here). I should emphasize that this is measured in game wins. Obviously you don’t win every game so you can roughly double these numbers to get to total game count if that is what you are more interested in. My reading of this says that you have gotta be playing close to 50 games a day before you are really noticing the difference in pay out. During the times that I was bingeing Eternal the hardest I was significantly above this on some days, but even for me during my peak output I was not playing 40 games on the average day. Some may argue that a pack is not truly worth 1000 gold to them, which is a fair analysis, but even if you thought it was worth 500 gold, you need an average of over 15 wins a day to fall behind the old system. I should also emphasize that this is only for ranked. If you just move to draft your returns are uncapped. If you are someone who tends to play in marathon sessions, and are looking to maximize EV, you can just save your gold to draft once you reach the max gold for a day, and then you can switch over to limited. If you are someone who is playing an average of less than 40 games a day, this change is probably a big boost. This is especially true for new players that will be getting a constant flow of new cards by opening at least 1 pack per day. This change to the economy has a number of other minor effects, but it is probably not worth dwelling on them in any detail. Although I have been critical of some mistakes that I felt DWD made in terms of pay-outs in the past, this new rewards system is truly exceptional, and I expect will help substantially with new players building collections and staying involved in the game. I had a lot of confidence that the metagame would shift upon the release of set 2, but I have honestly been a little surprised by how much things have changed. Though ETS finals results do not look substantially different from before Omens of the Past, I feel the ladder has changed substantially. Several new archetypes have emerged as popular and powerful strategies. Skycrag Aggro was a clear front runner at first, but it feels as if the meta may have adjusted already. Though the strategy has an extremely fast kill if left unimpeded, the units are slightly lackluster when actually forced into combat. Any strategy that is planning to end the game via burn spells is also going to really struggle against opponents with substantial amounts of life gain. This is part of the reason Chalice has become such a substantial part of the metagame. Between gumming up the board starting on from the first couple turns, as well as gaining big chunks of life, Skycrag is really going to have difficulty closing out the game. What I have probably been most surprised by is the scarcity of midrange. It might just be me, but it feels like Sandstorm Titan is almost nowhere to be seen. This might be a function of people being attracted to shiny new things, but decks like Combrei and Elysian feel almost non-existent. I suppose this is not as surprising if you consider the direction of the metagame. Burn heavy aggro has always loved to play against decks that are looking to tap low through the mid game. I play a Titan on 4, but you have Vanquish, Annihilate or Obliterate to finish up the game. Maybe these decks just need to lower their curves. Is the time for The Great Parliament or Mystic Ascendant past us? If that is the case, I feel like Combrei must just concede to dedicated control decks. The metagame is moving very quickly it seems, so all these musing are probably pre-mature. New decks are constantly being developed and tested all across the metagame. I expect it will be quite some time before things stabilize to the point that a well-defined tier list will actually be possible. It is certainly an exciting time to brew and battle! There were a couple of cards that I discussed in my review that drew a particularly critical response from a range of people – including some members of RNG Eternal. I wanted to talk about my reasoning in more detail, and provide some rational for my opinions. I have articulated bits of this reasoning elsewhere, but not quite in the level of detail I go into here. Let’s take a look at two cards – Fallen Oni and Trailblaze. In my review I gave this guy 1 star. I basically said that he was too low impact to matter. Some argued that I was undervaluing the effect, and that by playing the Oni you were “virtually” killing the top unit of their deck. In addition, it is possible to recur Fallen Oni with things like Memory Dredger. I think that this thinking is flawed, so let me explain. First, I want to be clear about what we are comparing Fallen Oni to – a removal spell. A 1/2 body is not “real” in that it will very rarely trade for a card. A 1/2 isn’t nothing, and it can either chump or multiblock, but I don’t think that is sufficient to consider a 1/2 to be worth a “card”. So, if this is a removal spell, how should we evaluate it? Well, it kills the unit before it comes into play, which is upside in many cases. Revenge, Aegis or Entomb units are all easier to remove from the deck compared to the board. But, in exchange, you are hitting something at random. You don’t get to control if the top unit of their deck is Icaria or Artisan, Soulfire Drake or Oni Ronin. This is even ignoring In a sense, it would be like a removal spell that was both purely unconditional, but also purely random. This is even ignoring the fact that you can hit things like Dawnwalker, Vara or Gorgon Fanatic, which can actively advance your opponent’s game plan (or you can hit a unit that is later picked up by a Smuggler’s Stash). Next, we need to consider the metric of card advantage. Fallen Oni kind of “kills” a unit from their deck, but instead of drawing that unit they get to draw a different card. That is a big deal. What if the top unit of their deck is an Oni Ronin and right below that is a Soulfire Drake? What if the next card you draw them into is a Harsh Rule to clear your board or a burn spell to end the game? It isn’t even like it needs to be the next card to matter. For the rest of the game they are now 1 card deeper into their deck to find critical cards that are important for winning the game. I have been playing a lot of Chalice recently. If I don’t have a chalice by turn 6 or 7 I would love for my opponents to play a Fallen Oni against me to get me one card closer to my Chalice. This is part of the reason I find the idea of Memory Dredger/Fallen Oni particularly weird. If you are able to recur Oni again and again, aren’t you just helping me draw into my removal for Dredger? I understand that not every game are you drawing your opponent into the prefect card by playing a Fallen Oni, but you need to understand that this is part of the range of such a such a card. While Fallen Oni is sort-of a removal spell for a unit in your opponents deck, in some ways that is giving too much credit. What if you draw him at a point in the game where there are only 2 or 3 turns left to be played? There is a very real chance that your Fallen Oni was just a 1/2 for 1. “But Neon! You are expecting too much from a 1-drop! Oni Ronin would have done just as much in that situation!” Although that is true, I think that is ignoring the kinds of decks that these 1 drops go into. Oni Ronin has a very clear game plan, and you get to execute on that with great consistency in almost any deck he is a part of, since there are a number of other 1 and 2 drops that all kill your opponent. Is Fallen Oni going into an aggressive deck? I rather hope not, since he isn’t exactly a high quality beater. What about a midrange or control deck? Well, why does a midrange or control deck need to play 1-drops? Most of the popular midrange and control decks try to limit the number of dead draws in the mid-to-late game. Compare drawing Fallen Oni in these late game scenarios to the low drops actually played in these kinds of decks – Temple Scribe, Kothon, Argenport Instigator, Desert Marshall… These are all cards that are great on turn 2, but are also at least passable in the late game. Now, I will recognize what Fallen Oni does do. He is really good at eliminating very particular types of threats. If some variant of “Makto Control” (playing only Makto as a win condition) becomes popular, Fallen Oni is at least interesting. You are really undermining their game plan in a manner that other cards cannot. Playing Fallen Oni after an opponent slams with a Hammer of Might is at least something (even though I think I would prefer to have a Deathstrike). Your average opponent needs to be playing a number of threats that are significantly more difficult to handle while in play compared to when they are in the deck. I just don’t think the metagame is remotely close to such a space. In addition, you need to be playing a deck that is able to recuperate the card disadvantage of utilizing such a low impact card. I am thinking of something like Memory Dredger, Vara or Sleepless Night. Those are some very strict conditions. For some this rant may seem entirely unnecessary, but I think some are truly misunderstanding this card. We should remember that all cards should be evaluated on the basis of “average” case scenarios. Although we can dream of knocking out some high value unit from the top of their deck, that is just not where this card fits most of the time. We can’t evaluate cards based on only their best-case scenarios, but rather on their normal case scenario. I think some might be falling victim to this best case scenario mentality. This card is in a much different space than Fallen Oni. I think Fallen Oni is actively bad to put in your average deck, while Trailblaze is simply overvalued. Before going on my tirade, I want to make this very clear – there is a floor on how bad “2P Draw a card” at fast speed can be. Trailblaze is better than that card, but it should be clear that any cheap spell that can replace itself can only be so bad. Still, I feel like people are overplaying and overrating this. Now, Trailblaze is clearly better than “2P Draw a card”. It has the “scry” mechanic built in. Someone on Reddit challenged me and said Trailblaze was close to Quarry in power level. Quarry, in my opinion, is the best “2X Draw a card” in the game (at present), and is much better than Trailblaze. Why is that? I will give you a slightly edited copy of my reasoning from the Reddit thread..
First, scry + draw (in Trailblaze) is a TON worse than look at 2 draw 1 (for Quarry). Any situation where the top card is kinda bad but the second card is worse u are worse off. Also, if the first card is good, but the second card is bad, you still need to draw that bad card. Also, most decks that play quarry have some amount of void interaction, so the fact that you can dump an Icaria into the void knowing you will have access in the late game is a plus, but if you are putting it on the bottom of your deck you basically never have access to her (without Rise to the Challenge). Finally, quarry reduces the cost by 1. THAT IS MASSIVE! Especially when you can get multiple uses through recurring it. The only advantage that Trailblaze offers is that it is fast, but that is not a massive upgrade most of the time. Yes, I get that “Fast” matters some time, but I would argue it is right to play this on your own turn like 1/3 of the time (such as in the late game), and another 1/3 of the time it makes literally 0 difference than you cast it on your opponents turn (like on turn 2). So, Trailblaze is worse than Quarry, but that is not a fair comparison. But how often does Trailblaze need to “scry” something to the bottom for it to be better than Herald’s Song or Second Sight? Pretty often I think. I actually think that Levitate and Inspire are just better cards. Even in a unit poor deck you can use Levitate to pick off aegis from your opponent’s units, as well as costing half as much as Trailblaze. I also saw some decks from this week’s ETS that played Trailblaze over Inspire, even though they could cast both. That seems crazy to me. I think a properly tuned decks will generally be able to substitute Trailblaze for something more impactful. Figure out what your deck actually needs more of and add that, rather than throwing in an inefficient draw spell. Once again, there is a limit to how bad a card like this can be because it replaces itself, but I think many people are overvaluing the “scry” value of this card, and under-rating how clunky it can be. Tranquil Scholar – After my set review there were a few people called me out for undervaluing this card. I still don’t think it is great, but I will admit that it’s ceiling is probably higher than I gave it credit for. I think I can find a shell where he can get me to Master, especially considering the wide range of decks where he could be a role player. Torgov, Icecap Trader – though he has not found a real place yet, I still think this guy has the potential to be a beast. 4/5 for 4 is already super solid, and those abilities are extremely cool. I have tried him in some versions of Skycrag aggro, and although he was fine, there is more to explore I think. Watcher of the Big Ones – What a cool legend! Though I am still not sure how the flavour of this card is supposed to work, I am still a huge fan of the idea of building around this guy. It is odd that midrange decks have tended to be left out in the early stages of brewing. Mentor midrange could very easily be a great deck. Slimespitter Slug – Big Slugger here has been a rock star in draft, but has not quite oozed his way into ranked. I am just imagining playing him out to counter an opponent’s Great Parliament, or eat some Cloudsnake Harriers. Maybe Xenan or Feln-lysian midrange is the best home? Workshop Forge – I guess this would be more a commitment to get to master playing the “Warp deck”. Some people messed around with this at the start of the format, but gave up as it became clear the deck had some weaknesses. I really do think Forge could have a place in the metagame, we just need some hard work from deckbuilders! Knucklebones – it is so weird that “Knucks” is already mainstream. It is shocking how many people have already fallen in love with this card, and started brewing all kinds of crazy Knucklebones decks. That being said, I still think there is more room to explore. Then again, maybe Knucklebones is not hipster enough to make the cut? Hero of the People – why am I putting a set 1 card here? I thought this was supposed to be set 2 focused? Well, Hero of the People has been in second place for the Brewer’s Challenge twice. First time she was narrowly beat out by Rilgon, and the second time she was squarely defeated by Nightmaw. I think she deserves another try, especially with a new keyword for her to work off of. That’s everything! Thanks so much for joining me today! Looking forward to cooking up some spicy brews on my way to Master next month. Ignore everything about these cards other than one of these two types of card selection. Fast/slow, 1F/2F, goes to void/goes to bottom don’t matter. Let’s say that every card in your deck is valued 1, 2, 3 or 4, (4 is best 1 is worst), and they each occur in your deck in equal frequency. All “1” cards are of exactly equal value, same with all “2”s etc. The value of each card can actually be capture in a linear numerical scheme. A 1 is “1 unit worse” than a 2, and is “2 units worse” than a 3 etc. This is an oversimplification of card quality, since a power off the top in the late game is worth hundreds of times less than most non-power cards. Still, we are just going to pretend that this numerical scheme actually captures card value. Given the above assumptions, the average value of a card in your deck is 2.5. We will treat the “third card down” and every card beyond that as worth 2.5. You are able to identify the exact value of these cards upon seeing them. We are only looking to maximize the value of our draw steps over this turn and next turn. If you are casting Quarry you just select the highest value of the cards that you see. If you are casting Trailblaze you look at the top card and assess if the value is above or below the average value. If it is above the average value (3 or 4) you keep it, but if it is below (1 or 2) you skip it. There are a total of 16 possible configurations of the top 2 cards. A 1 value followed by another 1, a 1 then a 2, etc. Since there are a limited number of scenarios we can actually work out in what situations the average value of your draw is better with Quarry or Trailblaze. Take a look at the following chart. In many situations like 1>1, 1>2, 2>4 etc. the two are worth the exact same. If the first card is bad we skip it with either Trailblaze or Quarry, and draw a better card. In the case that the top card is poor, but the second card is really bad (2>1) Quarry actually comes out ahead. You draw a 2 this turn, and then start drawing 2.5s from your deck. Trailblaze forces you to draw a 1 this turn, and then you start drawing 2.5s next turn. In cases where your top card is good and you second card is bad (3>1, 3>2 etc.) then Quarry is better again. You draw either a 3 or 4 this turn, and then go back to 2.5s for next turn. In the case of Trailblaze you draw your 3 or your 4 this turn, but now need to draw a 2 or a 1 next turn before you get back to drawing 2.5s from your deck. Trailblaze is better in many cases where both the first and second card are good. In a situation where you have 3>3, 4>3 or 4>4 you get get to keep your 3 or 4 this turn, and then draw a 3 or 4 next turn. Quarry would have been forced to ditch your second card. One situation that is kind of weird is when you have 3>4. If you are playing Quarry you get to keep a 4 this turn, then start drawing 2.5s afterward, meaning that your card quality this turn is maximized, while your card quality next turn is lower. In the case of Trailblaze your card you draw now is slightly worse than Quarry, but next turn you get a great card. Trailblaze maximizes card quality over 2 turns while Quarry maximizes card value over 1 turn. This is difficult to score because it depends on how much you value this turn versus next turn. I will personally just score this as a tie for the purposes of this discussion. So, if you all of our assumptions hold, Trailblaze is better than Quarry in 3/16 possible scenarios, while Quarry is better in 5/16 scenarios. By this logic, Quarry is better selection/filtering than Trailblaze. One assumption that is particularly weak for the purposes of our conversation is the equal distribution of scores. In most cases, I would estimate that less than 50% of you deck is actually a good draw. For example in a top decking situations in the late game, all power or cards that cost less than 3 are worth about nothing, meaning that as much as 70% of your deck is actually worth 1 or 2. In our above scenarios we saw that Quarry was usually better when the top card is good and the second card is bad, while Trailblaze is generally at its best when both the top cards are good. If the distribution of the scores is actually skewed such that 1’s and 2’s are much more likely than 3’s and 4’s, than you would expect that the frequency of both cards being good is much lower than only the top card being good. Although I am sure that my average reader doesn’t care about this, I wanted to share that point for anyone interested in a more detailed breakdown of the differences between “look at 2 pick 1” versus “scry 1, draw 1”. Been playing sleepless nights in my Makto Feln deck as a quick way to churn through the top of my deck once i’ve had a couple of makto’s die, and has really made me happy with how well the two of them “replaced” the old Vara chains package for inevitability. Quick take: quarry is easily better than trailblaze, but trailblaze is better than all the other things you discuss, synergies aside. That leaves a rather narrow band of decks for trailblaze, but it is #2 in a vacuum, especially once the fast speed helps.